Earlier this year, I had the opportunity to review BigIQkids with William and Thomas. You can read about that here. This fall, I've had the chance to let Connor try out a new feature they have added since then: SAT Vocabulary Prep. We are loving this! What is it? They have created a program to work through the 5,000 "SAT Vocabulary" words. And by this, they don't just mean to memorize a bunch of random definitions. This is the menu you get when you start up, and the idea is to complete a lesson per day. When you start with a fresh list, that can include as few as 10 words, or as many as 60. YOU set that number. So for an older student, you could have them work through more words. You are given the list, and you can open up each word to hear the pronunciation, see and hear it in a sentence, and read definitions. The fourth lesson is a vocabulary bee. Connor seemed to particularly like this section. This involved some different words. The fifth day has them doing "sentence completion" and seemed pretty effective. Days 6 and 7 are tests... one on spelling, one on vocabulary. 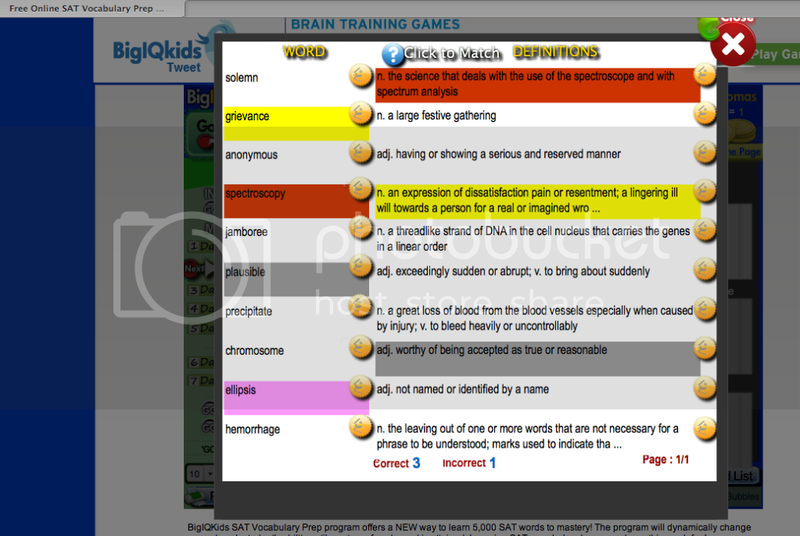 Then the system generates the next vocabulary list for the next set of lessons. And this is the great part. If a student got a word right in all of the sections, it goes away. But if a student answered incorrectly, that word is studied again. Connor had two words from this first list reappear for the next set... and got eight new words. This means that he isn't stuck continuing to work on words like solemn, jamboree and plausible just because he messed up ellipsis. This SAT Vocabulary Program is available for $99.99 per year, and you can try it out for free. You can find more information about their other products -- spelling, vocabulary, math, etc. -- by visiting this page. Disclaimer: As part of the TOS Homeschool Review Crew, I was asked to review this product. All opinions are my own, and receiving complimentary products does not factor in to my opinions. For more about my take on reviews, visit my blog post here.